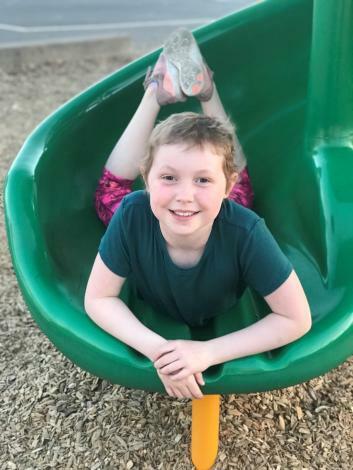 Molly was diagnosed with Acute Lymphoblastic Leukemia in April 2018, at the age of 8. Molly has always been an active and happy girl, so when she was complaining of leg pains and we started to notice that she was becoming fatigued at the slightest activity, we became worried. Her doctor sent her for blood work on the morning of Friday, April 27, and less than two hours later he called me sounding very concerned telling me to take her to the ER. It was only a few hours later we were told she has cancer. Two days later, she started chemotherapy. Molly has handled her treatment extremely well. She has attends school regularly, continues with her dance class, and even began piano lessons in July. She has been largely unaffected by the side effects of chemo -what a blessing! She did lose her hair, but its growing back now and she has taken it all in stride, passing the long treatment days with reading and listening to Harry Potter, watching movies, coloring and drawing. She is looking forward to playing soccer and basketball again soon. Currently she’s in maintenance therapy and should be finished with all of her treatment in August 2020. Wonderful friends and family, an excellent medical team and organizations like LLS and the Make-a-Wish Foundation have helped us tremendously during this incredibly difficult time.